I can't say I'm very excited about this one. Actually I'll go further than that, I'm tired of successful first films being rewarded with unnecessary sequels solely to get more money from audiences. Quality be damned. Which brings me to BAD SANTA 2. 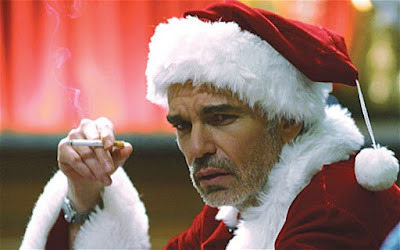 I admit I am not too keen on the original 2003 film (sorry, I don't find a pissy Santa very entertaining to watch), so the news of Billy Bob Thornton (in whom I have renewed interest after Fargo's first season) reprising his role doesn't have the same impact on me as, say, it does for probably everyone else (though Kathy Bates playing his mom is kinda intriguing). Until Lauren Graham officially reprises her role, I will stay completely uninterested. Mark Waters (Mean Girls, Freaky Friday) will direct from a screenplay co-written by Doug Ellin (Entourage) and Shauna Cross (If I Stay, Whip It). BAD SANTA 2 opens in theaters nationwide on November 23, 2016. I love Bad Santa but WHY?!? !